Kenyan entrepreneur Wambui Mukenyi studied accounting to appease her parents, but her real passion has always been fashion. While in school she interned as an assistant for a designer for two years and got to see how the fashion business works. When she graduated, then aged 24, Mukenyi started her own business using her personal savings and financial support from her family. Mukenyi initially rented a small studio in 2009 and worked on her first collection “which was received well”. 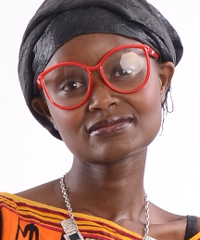 As demand for her fashion brand, Wambui Mukenyi, grew, she moved to a larger store. The company currently operates one store in Nairobi and another in Kilifi on the Kenyan coast and plans are underway to open a third outlet in the capital city. Its products also sell online on various ecommerce platforms. “We want to open more branches in Kenya but we do not have enough money to finance that. We are looking for funds because opening in a shopping mall is quite expensive,” she adds. The Wambui Mukenyi label is targeted at corporate women and bridal parties. The fashion house uses local celebrities such as news anchors and actors as brand ambassadors, and social media channels for marketing. Mukenyi says the biggest hurdle she faces is accessing talent. “Getting a good team in place is a challenge,” she says. Finding some fabrics locally is also difficult and this has prompted Mukenyi to import from China. The soft-spoken entrepreneur attributes her success in business to persistence and creativity. The self taught designer warns other entrepreneurs against trying “to be a Jack of all trades”. While women in Africa continue to face challenges in accessing financing and being accepted in the business world, Mukenyi says they should not dwell on the negatives and use the challenges they face as excuses to not pursue their dreams.